The Asia Bible Commentary series empowers Christian believers in Asia to read the Bible from within their respective contexts. Holistic in its approach to the text, each exposition of the biblical books combines exegesis and application. The ultimate goal is to strengthen the Body of Christ in Asia by providing pastoral and contextual exposition of every book of the Bible. The book of Lamentations cannot be truly appreciated without knowing suffering and the agony that follows tragedy. 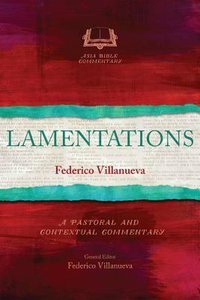 In this commentary Dr. Federico Villanueva relates the experiences of his fellow Filippinos in the wake of Typhoon Yolanda to the experiences of the Jewish people after the destruction of Judah and Jerusalem by the Babylonians. By drawing these parallels the author hopes that together we will read Lamentations in collective solidarity with a suffering people. About "Lamentations (Asia Bible Commentary Series)"